Discover the idyllic Croatian archipelago and Dalmatian Coast on a 7-night cruise from Split. In the day, use your free time for cool-down dips in the sea and dock overnight in the mainland towns of Split and Dubrovnik and the islands of Hvar, Mljet, Omis and Korčula. With only 18 cabins, the boat is just the right size to get up close to the tinier, secluded islands that the bigger vessels can’t reach. Enjoy half-board catering in your cruise, and optional excursions and tours at your own expense, if you wish. A bordo del MS Adriático Princesa, de tamaño íntimo, tiene todo lo que necesita para navegar por el Adriático con comodidad. El barco también tiene un área de comedor, bar y una cubierta de tamaño considerable que es el lugar perfecto para recargar el bronceado mientras navega. Para comenzar su experiencia, haga uso de un traslado del aeropuerto al puerto y embarque al comienzo de la tarde. O bien, comience con un traslado al puerto desde su hotel. Una vez a bordo, conozca a su anfitrión para conocer su itinerario completo. Su crucero incluye servicio de media pensión para que pueda disfrutar de desayunos y almuerzos (excepto el día 5 cuando le servirán el desayuno y la cena). El resto de su tiempo en el barco es tiempo libre, y cómo lo disfruta depende de usted. Disfrute de una excursión incluida a Montenegro, y participe en otras excursiones diarias y excursiones guiadas a su cargo, si lo desea. Lea el Itinerario para más detalles. El embarque comienza a la 1pm. Disfrute de una bebida de bienvenida y un refrigerio a bordo, y tenga la oportunidad de conocer al director de su crucero y al equipo. Después de una sesión informativa de seguridad y tiempo libre para acomodarse, cenar a bordo y ver la ciudad una última vez antes de la salida de la mañana. Durante la noche en Split. Después del desayuno, opte por un tour a pie por Split con un guía que le mostrará el Palacio de Diocleciano, construido hace más de 1,700 años. Desde entonces, el casco antiguo, declarado Patrimonio de la Humanidad por la UNESCO, se ha desarrollado alrededor del palacio, creando un paisaje urbano único. Zarpe hacia Hvar, conocida como la isla más soleada de Croacia, famosa por sus campos de lavanda y romero, su pintoresca costa y sus ciudades históricas. Al llegar, desembarque con su guía para pasear por las calles antiguas. Después, diríjase a la isla de Korcula. En el camino, pare para nadar en las islas Pakleni. Disfrute de un bocadillo de pescado frito dálmata antes de llegar a Vela Lula (Isla Korcula) al final de la tarde. Pernocte en Vela Luka (Isla Korcula). Después de dejar Vela Luka, su capitán anclará en una de las bahías escénicas para que pueda nadar en el Adriático, rodeado de pinos y el sonido de los grillos. Continúe navegando hacia Pomena en la isla de Mljet, hogar de un parque nacional conocido por sus dos lagos turquesas rodeados de densos bosques. Disfrute de un montón de tiempo libre para explorar el parque, alquilar bicicletas o trotar en los senderos que rodean los lagos o los bosques. Si te apetece relajarte, puedes dar un paseo en bote a una pequeña isla en uno de los lagos, hogar de un monasterio y una iglesia del siglo XII. Salida hacia Slano a última hora de la tarde. Después del desayuno, puede tomar el tour opcional Taste of Dalmatia, donde visitará Ston, una pequeña ciudad famosa por sus murallas (la más larga de Europa), y luego visitará una bodega local. Más tarde, navegue a la isla Lopud para nadar un poco antes de continuar hacia Dubrovnik y Gruž. Disfrute de una excursión a Montenegro después del desayuno. Situado a menos de una hora en coche de Dubrovnik, Montenegro ofrece impresionantes playas y paisajes de montaña. Llegue al Golfo de Kotor, una de las primeras áreas habitadas, con evidencias de civilización que datan de los períodos ilirios, romanos y cristianos primitivos. Salida por la mañana de Dubrovnik a Korčula. En el camino a Korcula, pare a nadar y relájese en una de las islas Elafiti. El almuerzo se servirá a bordo antes de la llegada por la tarde a Korcula, el supuesto lugar donde nació el famoso explorador Marco Polo. Luego, disfruta de un paseo por la ciudad de Korcula con tu guía. Aprende sobre su historia, arquitectura y la leyenda de Marco Polo, quien pasó su infancia en las calles de Korcula. Navega hacia Brač. Su capitán anclará en el camino para nadar en una bahía aislada, después de lo cual continuará su viaje hacia Pucisca. Después de atracar en Pucisca, visite una escuela de mampostería de piedra cercana donde aprenderá sobre la piedra caliza de Brac. Continuar a Omiš, conocido por su pintoresco cañón Cetina. Opte por tomar un viaje por el río Cetina, seguido de una cena a bordo. Temprano en la mañana salida de Omis hacia Split. Debark después del desayuno. Fantastic trip. the Nikola was great, from the atmosphere, size and accommodations. The route taken for travel was well done, from as busy as you like or as quiet and relaxing. Would recommend. Ship was too small and the details we received from Viator were incorrect, Not a good trip and would never use Viator again. The cruise ended today and I so wish that I could still be on the cruise. The MS Nikola is a lovely old boat with plenty of seating area options to enjoy the cruise. The crew, especially Tom, are great and available to help out with anything you need during the trip. We went to Hvar, Korcula, Slano, Dubrovnik, Mjet, and Omis on our trip with swim stops on 3 of the days. We had some bad weather upon leaving Dubrovnik so that changed our itinerary slightly, but honestly, I rather enjoyed having one day where absolutely nothing was going on. This is not a luxury cruise, so, if that is what you're after, don't book this trip. However, the cabin was very comfortable and what I was expecting for a boat trip make realistic expectations. The bathroom each cabin has its own is a combination shower/toilet/sink, but very workable. I'm 6'1, and was perfectly comfortable in the cabin and bathroom. The meals breakfast and lunch were always delicious if a bit filling. Don't bother booking dinner as part of your meal plan - you'll want to eat in port. As for the cruise director - he was fine, but really I don't see the benefit of having him onboard. He managed to disappear himself during cruising time and only appeared after lunch to let us know where to meet if you booked the tour for that port and recommend a restaurant for dinner. Otherwise, Tom was much more available and open to providing information about where we were going, etc. I met a real great group of fellow passengers and even though I was traveling solo the others were very welcoming and a real pleasure to spend 7 days with. The captain of the MS Nikola is a bit of a grump and does not interact with his passengers in the least, but this is okay. He does a fine job of getting us to our destinations and ensuring our safety. I just wish they would have a 2 week option of this trip in order to spend 2 nights in each port and truly experience each place. Great tour on a smaller boat 24 passengers total. We got the half board, which includes breakfast and lunch. The breakfast was continental but plenty to eat and the lunch was more like dinner. Several very nice excursions were set up by the cruise manager that we took part in but were extra: 20-25 - a traditional meal and tour in a small village outside of Korcula, boat excursion in some canyons, ... Our tour was on the MB Nikola. The crew were very helpful. Only surprise was that the boat stayed in Split port on Saturday first night instead of Friday last night as our itinerary stated, which may have affected when we got into Split. Overall the cruise was good. We enjoyed the island stops, the boat was nice and clean, and the crew was wonderful. It was supposed to be an independent cruise but I guess from what I heard from the crew, having a tour manager on board was something new this year. The tour manager 'persuaded' us to join the walking tours at each island stop, for extra charge of course. We were told it's optional, however if the minimum number of participants is not met, the tours will have to be cancelled. It was not in our plan but we ended up going as we felt bad for those who wanted to go. It would not have been a big deal but the quality of the tour was just so-so... I wish we were informed about this upfront or should just have included it in the total price of the cruise so there are no surprises. Good value for money. The itinerary is very well planned and combines smaller with bigger villages, natural parks and coastline. The food onboard was delicious, freshly cooked every day, and a great opportunity to try local delicacies. The crew also caters for food intolerance and provides alternative options. The accommodation was comfortable, and the sailing smooth and easy. Overall a very nice experience; I would do it again! For all of you wondering who runs this tour, it's a company called Elite. It appears that they subcontract with individual boat captains so you may not know what boat you'll be on until the last moment. They also use a variety of travel agents to book this tour. Unfortunately, because there are so many people booking and coordinating this trip, there is a lot of misinformation out there about the price, schedule, and timing of this tour. Make sure you confirm start time with the travel agent who emails you. Of the 38 passengers on board, we were all told different start times ranging from 11 am until 5 pm. The reality is that Elite allows the passengers to dictate when this tour leaves by being flexible on arrival times. This means you could be stuck in Split for a lot longer than you want. Don't arrive early. 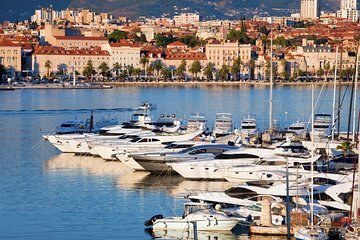 Despite what is publicized, the boat returns to Split by 1:30 on Friday and you overnight in Split harbor. Return flights can be booked for any time on Saturday - no need to add an extra day to accommodate an unknown arrival time. Viator's price included three meals a day. Not all passengers are required to pay for full board, so look around if you're interested in just half board. I would recommend half board. The food is plentiful but very average. The boat can accommodate dietary restrictions but confirm multiple times in writing. My biggest tip - force the crew to give you information about the schedule. The crew can and will vary the stops depending on the demands of the passengers. Unfortunately, the changes are not made democratically and you may not even be aware that you had options before changes are made. If you want the publicized intenerary - make sure you say so. Communication is weak on both Elite's and the crew's part. We didn't see a representative from Elite until Wednesday, and even then she showed up unprepared. We sailed on the Mb Nikola. The boat is clean, but old. This is not a luxury cruise so manage your expectations accordingly. This is an amazing trip...they let you go your own way but are always on hand with recommendations if you ask for them. Weather was beautiful and it was so relaxing watching the islands float by while sitting in a recliner on the deck in the shade! The ship is in great shape and the room is small but well-equipped. A relaxing and enjoyable way to visit Croatia. The crew were very attentive, the food was good and the trip ticked all of the boxes.